The Official Story (Spanish: La historia oficial) is a 1985 Argentine drama historical film directed by Luis Puenzo and written by Puenzo and Aída Bortnik. It stars Norma Aleandro, Héctor Alterio, Chunchuna Villafañe and Hugo Arana. In the United Kingdom, it was released as The Official Version. The film deals with the story of an upper middle class couple who lives in Buenos Aires with an illegally adopted child. The mother comes to realize that her daughter may be the child of a desaparecido, a victim of the forced disappearances that occurred during Argentina's last military dictatorship (1976-1983), which was marred by widespread human rights violations and a genocide. Among several other international awards, it won the Oscar for Best Foreign Language Film at the 58th Academy Awards. The film is set in Argentina in the 1980s, in the last years of the country's last military dictatorship, during which a campaign of state-sponsored terrorism produced thousands of killings and torture of accused political leftists and innocents alike, who were buried in unmarked graves or became desaparecidos. Alicia, a teacher, and Roberto, a government agent, live in Buenos Aires with their adopted daughter, Gaby. On Gaby's fifth birthday, Alicia wonders about Gaby's real parents, a topic her husband has told her to ignore, although he seems to know the story of his daughter's adoption. Ana, Alicia's longtime friend, returns from exile and tells Alicia about having been held and tortured for having lived with a man labeled as a subversive. When she tells Alicia that she had seen children taken away from their parents in jail, Alicia begins to think that Gaby's parents may have been similarly arrested. While searching for records about Gaby at a hospital, Alicia learns of an organization searching for missing children. A woman there, Sara, believes Gaby may be her granddaughter, whose parents had disappeared. Alicia, like other members of the Argentine upper class, is not aware of how much killing and suffering has gone on in the country. Her views are challenged by a fellow teacher, Benitez (Patricio Contreras), and some of her students. One student argues that the government-issued history textbooks are "written by murderers." When Alicia reports the student, Benitez intervenes to protect him. Alicia gradually becomes friendly with Benitez as her research brings her closer to the truth. Roberto faces stress at work due to the machinations of his colleagues, several of whom disappear over the course of the film. Ana confronts him and accuses him of denouncing her and causing her arrest. He also comes into friction with his liberal father and brother, who frown on his ties to the ruling conservative military elite and argue in favor of social justice. Alicia brings Sara home to meet Roberto, and he becomes furious. That evening, Alicia surprises Roberto when she tells him that Gaby is not home, saying, "How does it feel not knowing where your child is?" Although she tells him that Gaby is at his mother's house, he becomes enraged and assaults her. The violence is interrupted by a telephone call from Gaby. While Gaby sings a nursery rhyme to Roberto, Alicia gets her purse and walks out the door, leaving her keys behind. The film's final shot shows Gaby sitting in a wicker rocking chair at her adopted grandparents' house, continuing to sing. The Military Regime of Argentina (1976-1983) saw widespread repression against those it deemed to be political dissidents. The film is based on the real political events that took place in Argentina after Jorge Rafael Videla's reactionary military junta assumed power on March 24, 1976. During the junta's rule, the parliament was suspended; unions, political parties and provincial governments were banned; and, in what became known as the Dirty War, between 9,000 and 30,000 people deemed left-wing "subversives" disappeared from society. Like many progressive actors and others in the country, the lead actress in the film, Norma Aleandro, was forced into exile during this time. She traveled to Uruguay first and Spain later. She returned after the fall of the military government in 1983. Aleandro once said, "Alicia's personal search is also my nation's search for the truth about our history. The film is positive in the way it demonstrates that she can change her life despite all she is losing." The Official Story can be considered alongside a group of other films that were the first to be made in Argentina after the downfall in 1983 of the last Argentine dictator, General Galtieri, and his autocratic regime. These films deal frankly with the repression, the torture, and the disappearances during Argentina's Dirty War in the 1970s and early 1980s; they include Funny Dirty Little War (1983) and Night of the Pencils (1986). A second group of films, which includes Verónico Cruz (1988) uses metaphor and hints at wider socio-political issues. At first, director Puenzo, fearing for his safety, intended to shoot the film in secret, using hidden 16mm cameras. But the junta government fell right about the time the screenplay was completed. The film was entirely shot in the city of Buenos Aires, Argentina, including the Plaza de Mayo where the Mothers of the Plaza de Mayo congregated in the late 1970s with signs and pictures of desaparecidos who were subjected to forced disappearance by the Argentine military in the Dirty War. The Mothers of the Plaza de Mayo continue to protest every Thursday afternoon at 3:30 pm in the Plaza de Mayo in Buenos Aires. 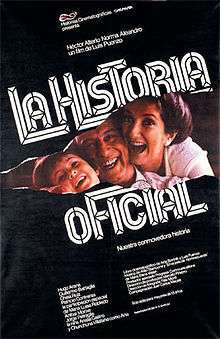 The Official Story first opened in Argentina on April 3, 1985. It has also been featured at various film festivals including the Toronto Festival of Festivals, the Berlin International Film Festival, the Cannes Film Festival, and the Mar del Plata Film Festival. The film won many awards when first released and, as such, the drama was widely well received in the 1980s. Walter Goodman, film critic for The New York Times, believes the film was well balanced, and wrote, "Mr. Puenzo's film is unwaveringly committed to human rights, yet it imposes no ideology or doctrine. The further miracle is that this is the 39-year-old director's first feature film." Critic Roger Ebert lauded the film in his film review, writing, "The Official Story is part polemic, part thriller, part tragedy. It belongs on the list with films like Z, Missing and El Norte, which examine the human aspects of political unrest. It is a movie that asks some very hard questions ... Alicia is played in the movie by Norma Aleandro, whose performance won the best actress award at this year's Cannes Film Festival. It is a performance that will be hard to forget, particularly since so much of it is internal. Some of the key moments in the film come as we watch Aleandro and realize what must be taking place inside her mind, and inside her conscience. Most political films play outside the countries that they are about; "The Official Story" is now actually playing in Argentina, where it must be almost unbearably painful for some of the members of its audiences. It was almost as painful for me." Film critics Frederic and Mary Ann Brussat, of the website Spirituality and Practice, were painfully touched by the story they viewed. They write, "The Official Story is a wrenching and painful drama that crystallizes the horror and the obscenity of political activities that annihilate family solidarity in the name of ideology...The Official Story packs a shattering visceral punch." A few critics were dismissive of the story Puenzo tells. For example, The Chicago Reader's Dave Kehr thought "Puenzo's methods are so crudely manipulative ... that the film quickly uses up the credit of its good intentions." Academy Awards: Oscar; Best Foreign Film; 1985. Los Angeles Film Critics Association Awards: LAFCA Award Best Foreign Film; (tied with Ran); 1985. New York Film Critics Circle Awards: NYFCC Award Best Actress; Norma Aleandro; 1985. Toronto International Film Festival: People's Choice Award, Luis Puenzo, 1985. Premios ACE: Premio ACE Cinema; Best Actress, Norma Aleandro; Cinema - Best Director, Luis Puenzo; Cinema - Best Film; 1986. Golden Globes: Best Foreign Language Film; 1986. Argentine Film Critics Association Awards: Silver Condor; Best Actress, Norma Aleandro; Best Cinematography, Félix Monti; Best Director, Luis Puenzo; Best Editing, Juan Carlos Macías; Best Film; Best New Actress, Analía Castro; Best Original Screenplay, Aída Bortnik and Luis Puenzo; Best Supporting Actor, Patricio Contreras; Best Supporting Actress, Chela Ruiz; 1986. Berlin International Film Festival: Interfilm Award, Otto Dibelius Film Award, Luis Puenzo, (tied with Un Complicato intrigo di donne, vicoli e delitti); 1986. Cannes Film Festival: Best Actress, Norma Aleandro; Prize of the Ecumenical Jury, Luis Puenzo; 1985. Kansas City Film Critics Circle Awards: KCFCC Award Best Foreign Film; 1986. David di Donatello Awards: David Best Foreign Actress, Norma Aleandro; 1987. Academy Awards: Best Writing, Screenplay Written Directly for the Screen; 1985. Cannes Film Festival: Golden Palm, Luis Puenzo; 1985. Sant Jordi Awards: Sant Jordi Award; Best Foreign Actress, Norma Aleandro; 1987. ↑ Channel 4 film review. ↑ Time Out London. Time Out Film Guide 13, 2007. ↑ "The 58th Academy Awards (1986) Nominees and Winners". oscars.org. Retrieved 2013-11-10. ↑ Curran, Daniel. Cinebooks: Foreign Films, McPherson's Publishing: 1989, page 132. ↑ Blommers, Thomas J. "Social and Cultural Circularity in La historia oficial," California State University-Bakersfield. ↑ Cinergía movie file by Cristina Molano-Wendt, Amy Bianchi, Shannon Tierny, and Brian Sabella. For educational purposes. ↑ new internationalist. Issue 192, February 1989. Last accessed: May 13, 2012. ↑ Curran, Daniel. Ibid, page 133. ↑ Asrianti, Tifa. The Jakarta Post, "Mothers of Plaza De Mayo: Justice for disappeared loved ones, one step at a (long) time," April 26, 2009. Last accessed: May 13, 2013. ↑ Goodman, Walter. "Screen: Argentine Love And Loss". The New York Times. November 8, 1985. ↑ Ebert, Roger. "The Official Story". Chicago Sun-Times. November 11, 1985. Retrieved: January 8, 2008. ↑ Brussat, Frederic and Mary Ann Brussat. Spirituality and Practice, film review. Retrieved: January 8, 2008. ↑ "Festival de Cannes: The Official Story". festival-cannes.com. Retrieved 2009-06-28. ↑ "1985 Award Winners". National Board of Review of Motion Pictures. 2016. Retrieved November 5, 2016.